Recorded in the months following the release of the mega successful 461 OCEAN BOULEVARD, THERE’S ONE IN EVERY CROWD was released in early 1975. It is a pleasant and unpretentious album which fails to challenge Eric Clapton and fails to excite the listener. It does have its moments however and definitely had a laid-back charm about it. The opening track, “We’ve Been Told (Jesus Coming Soon)”, has a nice gospel quality and features some tasty dobro licks. “Swing Low Sweet Chariot” has a clever reggae arrangement and smooth vocals by both Clapton and Yvonne Elliman. “Little Rachel” by Tulsa songwriter Jim Byfield is a nice one-chord rocker reminiscent of J.J. Cale and features some superb drumming by Jamie Oldaker. “Don’t Blame Me” written by Clapton and George Terry is an average song obviously intended to capitalize on the success of “I Shot The Sheriff”. “The Sky is Crying” by Elmore James and Morgan Robinson is a languid slow blues . “Singin’ The Blues” by Mary McCreary (Leon Russell’s wife) cooks along nicely and features Clapton’s best reggae vocal inflections and a nice wah-wah solo but pales in comparison to the live version performed at the Hammersmith Odeon in December 1974. [Check out the deluxe edition of the 461 OCEAN BOULEVARD album which features live tracks from the aforementioned concert. Four Clapton original songs complete the album. “Better Make It Through Today” is the best track by far. Great song, great vocals, great solo. “Pretty Blue Eyes” is another commentary on the Clapton/Harrison/Boyd romantic triangle and features gorgeous group vocals as well as a stunning acoustic guitar solo. “High”, originally written for the second (abandoned) Derek and the Dominos album, is excellent and has unison guitar playing reminiscent to the Allman Brothers Band. “Opposites” is a clever collection of declarative statements referencing the title and the ensemble playing of the band is impressive. Indeed, there is strong evidence on this album to suggest that the ad hoc band assembled after 461 OCEAN BOULEVARD had come together nicely as a cohesive musical unit and they would shine during their impending 1975 American tour to support THERE’S ONE IN EVERY CROWD. Interestingly very little material from this album was featured during the tour. In that respect, the 1975 tour was similar to Clapton’s most recent world tour during which he played little material from BACK HOME which ostensibly he was promoting. The Clapton (or Arthur Louis) reggae arrangement of Bob Dylan’s “Knockin’ On Heaven’s Door” released as single months after this album came out would have fit nicely in the song selection and no doubt would have strengthened the album which was poorly received upon release. There is some indication that members of Clapton’s own band were concerned about the inclusion of so many reggae tracks and that probably is the reason that some songs (“Whatcha Gonna Do” and “Burial”) recorded with reggae legend Peter Tosh were omitted from the album. Three reggae influenced singles (“I Shot The Sheriff”, “Swing Low Sweet Chariot”, and “Knockin’ On Heaven’s Door”) released within a one year span probably caused a fair amount of confusion and consternation regarding Clapton’s musical identity and overall direction. The phrase most commonly employed to describe him and his music during this time was “laid-back”. That impression as well the abundance of reggae influences on his latest releases was probably why RSO Records opted to release a live album in August. It not only capitalized on the positive buzz created during the American tour but also served as a reassuring sign to Clapton’s core fan base that he had not strayed far from his blues roots. Reportedly the original title for this album was “The World’s Greatest Guitarist…There’s One In Every Crowd”. This album is special, subtle, sweet and simply a damn fine album. I believe it is his best record, it certainly is my favourite and it is no surprise to know it's one of Eric's own faves. Whoever out there is suggesting we'd be better off with Pilgrim, Unplugged and the like really has no idea. This was the last album of Eric's to have any real soul and naturalness to it (other than the live album that followed it). 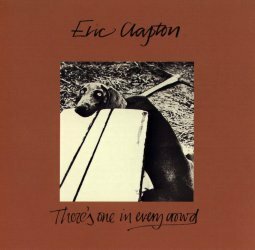 This record to this day is one of the big disappointments of Eric Clapton's career. This came after 461 Ocean Blvd and I think consisted of songs that couldn't make 461. This an album only for collectors who have to have all his CD's To me there are only 2 songs that warrant any attention. The First is better make it through today. This is a very slow bluesy song with a nice solo. It shows brilliance. Eric as on 461 remains laid back and it is still showing. The other song worth a listen is " The Sky is Crying" Which is another blues tune. I really don't recommend this to anyone. It is one of the low points of a brilliant career. I read an interview once where EC says this was one of his favourite albums. Save your money for Pilgrim, Journeyman, Layla or unplugged. I picked the digital surround version for DTS systems. It is AWESOME! The music gets better every time I listen to it. Well, that goes for all of his music. The set flows, as if conveying a message. Although "There's One In Every Crowd" suffers in direct comparison to "461 Ocean Boulevard", it is not a bad album by any means. It is a meticulous produced yet modestly ambitious work. If Clapton's intention was to distance himself from the virtuoso role of early works then this album was perfectly planned and executed. Typically, the best songs on any Clapton album are the blues selections as well as his original material. This is no different in that respect. "We've Been Told (Jesus Coming Soon)", The Sky is Crying", "Better Make It Through Today", "Pretty Blue Eyes", "High" and "Opposites" are the best tracks. "Little Rachel" is interesting as a one chord rocker and Clapton's playing is quite dynamic at the end of Mary McCreay's "Singin' the Blues". Not essential to the casual fan. A underrated masterpiece featuring a wide assortment of musical styles. Great soulful vocals and beautifully laidback guitar work. My only complaint is that it could have been a double album at the time of issue. Many fine tracks were left off including "Whatcha Gonna Do", "It Hurts Me Too", "I Found A Love" and others. The first Clapton album I ever bought, the day after I saw him play 'live' in Sydney in '75. Mainly because I loved his version of 'Sweet Chariot'. The rest of the songs grew on me and it became a favourite I've listen to a lot. 'Singin the Blues' is a great track. A great Clapton album to play when your in a laid back mood. I like this album a lot, it's not one of his best selling albums but he hadn't been discovered by the mass public yet it was several years before he would get that honor. All of the songs were very soulful, and had a lot of feeling in them. If Clapton would have been the Public darling like he is now this would have been a big seller. Fantastic back up band and singers.